Le Veon Andrew Bell, professionally known as Le Veon Bell is an American football player for the Pittsburgh Steelers of the National Football league (NFL). He is a running back and wears shirt number 26. He was drafted by the Steelers in the second round of the 2013 NFL Draft. Previously, he played college football at Michigan State. NFLDraftScout.com ranked Bell as the fifth best running back as he was ready to join the 2013 NFL Draft. Le Veon Andrew Bell was born on 18 February 1992. He was born to Lisa A. Bell. The name of his father is unavailable. His birthplace is Reynoldsburg, Ohio in the United States. He holds American nationality. He has two older sisters and two younger brothers. His zodiac sign is Aquarius. He belongs to African-American ethnicity. He attended Groveport Madison High School. At the high school, he was an athlete and played football, basketball and ran tracks as well. After graduating from high school in 2010, he attended Michigan State University. As a senior at high school, Bell ran for 1,333 yards on 200 carries with 21 touchdowns. He was selected first-team All-Ohio Capital Conference Ohio Division as a senior. He was considered a two-star recruit by ESPN.com and listed as the number 211 running back in the nation in 2010. He received a scholarship offer from Michigan State University. Bell enrolled in Michigan State University, where he played for the Michigan State Spartans football team from 2010 to 2012. Bell received All Big-Ten Freshman honors from ESPN.com and Rivals.com in his first season at Michigan. Bell ran career-high 253 yards against Eastern Michigan in his junior season in 2012. He also claimed the Big Ten Offensive Player of the Week Award. He was voted to the First Team All-Big Ten by the coaches and media, ESPN.com, College Football New, and Phil Steele. Bell forego his senior season at Michigan after his junior season in 2012 to enter the 2013 NFL Draft. NFLDraftScout.com ranked Bell as the fifth best running back as he was ready to join NFL Draft. The Pittsburgh Steelers selected Bell in the second round(48th overall) of the 2013 NFL Draft. Bell signed a four-year rookie contract with Bell for $4.12 million, that included $2.27 million guaranteed and a signing bonus of $1.37 million. Bell missed three weeks of his first season due to a mid-foot sprain in his second preseason game against the Washington Redskins. He made his professional debut against Minnesota Vikings in September 2013. Bell broke the Steeler's legend Franco Harris's rookie record for total yard from scrimmage with a total of 1,259 yards. He became the first running back in Steelers' history to have seven consecutive games with 100 yards from scrimmage. At the end of 2014 season, he was named to the Pro Bowl. His fellow players ranked him 16th on the NFL Top 100 Players of 2015. In 2014, Bell was suspended along with then-teammate LeGarrette Blount on DUI and marijuana possession charges. Bell underwent surgery to repair MCL injury suffered during the second quarter against the Cincinnati Bengals in November 2015. His rest of the season ended. Bell was once again suspended for three games of the 2016 regular season fro violating the NFL's substance abuse policy. He apologized via Twitter. Bell broke the Pittsburgh Steelers' franchise record for rushing yards in a game with 236 rushing yards on a career-high 38 carries while scoring three touchdowns. Bell was named to his second Pro Bowl in December 2016. and was ranked ninth by his fellow players on the NFL Top 100 Players of 2017. Bell became one of four players to ever rush for 150+ yards in the first two playoff games, and one of the three players with two 160+ yard playoff games in a career, when he made 167 rushing yards against Miami Dolphins and 170 rushing yards against Kansas City Chiefs. Steeler once again placed the franchise tag on Bell for the second straight year worth $14.5 million in March 2018. 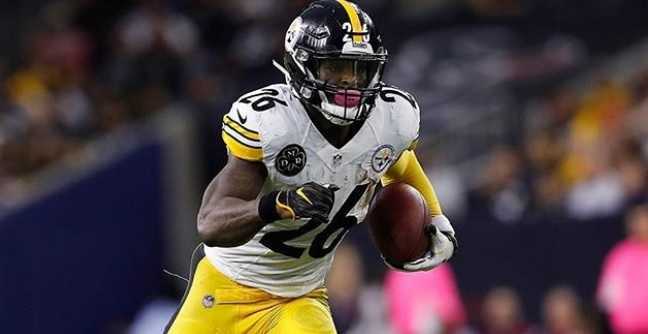 However, Bell refused to sign the franchise tag and did not attend any team activities, and also did not report to the Steelers prior to the league's November 13 deadline to sign his franchise tender. As a result, he is now ineligible to play in the 2018 NFL season. Bell started his musical career in 2017 with a stage name "Juice", as he released his 16-song album in March 2017. He released his album via SoundCloud. He released a single, "Target" in May 2018. The single was directed to the criticism in regard to his contract dispute with the Steelers. Later, he released four-song project, "My Side of Things". It was his side of the story regarding his second straight contract holdout with the Steelers. Bell is unmarried. However, he is in the relationship with Mercedes Dollson. The couple is blessed with a daughter born in January 2017. He has numerous tattoos on his body. He has Jeremiah 1:5 on his left arm with a picture of his mother embracing him after Michigan State suffered a loss in the Big Ten Championship. He also has 3:16 on his left arm, along with "That whosoever believeth in him should not perish, but have eternal life". 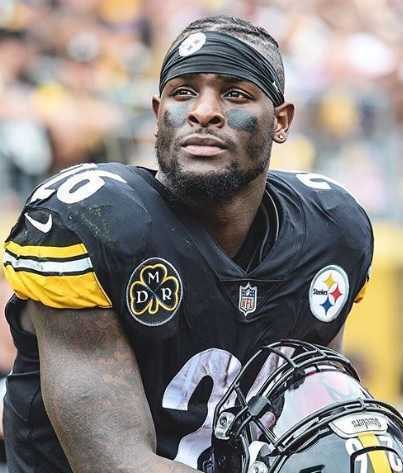 Bell was sentenced to 15 months of probation, a 60-day suspension of his driver's license, DUI education classes, and $2,400 in court costs, when Bell, his then-Steelers teammate LeGarrette Blount and an unidentified woman was pulled over by the police in August 2014. He is active in charity work and fundraisers and works with PETA. Bell stands at a height of 1.85 m i.e. 6 feet and 1 inch tall. He has a body weight of 225 lbs i.e. 102 kg. He has an athletic body. He has black eyes and his hair color is also black. He was selected in the second round with the 48th overall pick by the Pittsburgh Steelers in the 2013 NFL Draft. He signed a four-year, $4.12 million rookie contract in June 2013. His contract also included $2.27 million guaranteed and a signing bonus of $1.37 million. His annual salary is reported at $2,120,000. Earlier in 2018, he turned down a two-year deal worth $30 million. As of 2018, his net worth is estimated at around $12 million. His high school principal, Donis Toler Jr. was a father figure in Bell's life. At the high school, Bell also earned second-team All-OCC Division honors as a junior in basketball. He was also the state's top performers in the high jump with a personal best of 6 feet and 8 inches. NFL analyst Bucky Brooks ranked Bell the best overall running back as he was ready to enter NFL. Bell was suspended for three games after he got arrested on DUI and marijuana possession charges in 2014. Despite the injury in November 2015, he was ranked 41st by his fellow players on the NFL Top 100 Players of 2016. Steelers placed the franchise tag on Bell in February 2017.